What happens when you wake up one day to find you've become a bland middle-aged conformist pouring your talents down the corporate drain? What happens when it's your very prosperity that has you trapped? You get angry, but then what? In this piece, Susan B. Price explains how she tried to reinvent herself at the age of 50 by keeping an anonymous internet diary -- and the surprising results. 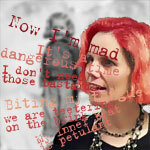 4/13/09 "Midlife Web Diary" is being distributed on the album Media/Tech/Art: Art On The Streets And Life Online. Today on iTunes (click PRX graphic above) and in the coming months on Amazon, eMusic, Napster, and Rhapsody. 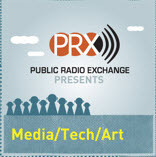 Also available for radio licensing and broadcast from PRX. I listened to this piece and then took a minute to think about it. And the more I thought about it, the more I liked it. It's just this kind of quirky, strange-but-true story that makes This American Life so fascinating. And the fact that Susan's whole online adventure led to a new life, and a new outlook, makes it more appealing to others. Especially women who might be in the same situation. KFAI, a non-commercial FM radio station operating on 90.3 FM in the Minneapolis area and 106.7 FM in the St Paul area.